I love little books that present the subject matter in clear and concise form and engage the reader in a practical way so that you can use the information immediately. Feng Shui, pronounced “foong shway”, is one of those topics that has hoards of books available that often contain either too much or too little information. As the title of this little treasure suggests, this book holds the basics of Feng Shui and provides the “just right” amount of information to get you excited to start the transformation. ….There are several different schools of Feng Shui thought. One, is based on a scientific and classical approach that uses astronomy, astrology and a powerful Chinese compass called a “Lo Pan”. Another concentrates solely on cures and enhancements, and a third is a blend of intuition and spiritual awareness. This book shows you how to try out some of the simpler principles of this highly organized system…..
Each chapter takes the reader through the why’s behind selecting to use Feng Shui in your space and the how’s to get started without needing to move doors, walls, sell or totally rearrange all of your belongs. The intention of Feng Shui is to tap into the flow of energy in a positive and supportive way in a proactive way that requires awareness of yourself, and your impact energetically on your surroundings. The additional component is that everything is created from energy, so those things we have as possessions also contribute to how we engage and interact with our surroundings. The First Chapter takes you through the processes of Decluttering, Space-Clearing techniques and the principles of Yin Yang. Chi (energy) flows in accord with what contains and expresses its qualities and we are reminded that at its origins the Chi of the natural world was more important than that of the home. Of course, at the origins of this ancient practice, what was defined as “home” was organically more integrated into the natural world than what we live in today. Chapter Two speaks to the origins and use of the Baqua, a prominent tool used in Feng Shui for assessing and mapping your space. The next chapters expand on the information you obtain in using the Baqua to assess and incorporate the Five elements. The Five Elements of Chinese use are slightly different than the traditional alchemical elements used in magickal workings. These are Fire-Earth-Metal-Water and Wood; each having their own particular attributes. There are quick lists and suggested cures and supports for each of the elements. Chapter Seven brings it all together with information relating to each area of the home and simple fixes to bring a more harmonious flow of Chi into these areas. I particularly liked Chapter Eight and the charts to establish your elemental energy type based on your birthday. This may seem like a tangential piece, but the synthesis of all of the energies that permeate the home, inclusive of those who reside in that space is demonstrated to be an important piece of a (w)holistic puzzle. I’ve long had an interest in Feng Shui and tried several applications based on books, online and more. But, this book truly lives up to its tile of being plain and simple, which is the perfect recipe for someone who doesn’t have a lot of extra time to spend in learning an Ancient discipline that is complex, nor the money to hire a professional. Kudos to Ms. Bartlett! The first thing that catches your eye about this book is the strikingly beautiful cover, but as the saying goes “never judge a book by its cover.” In this case, I can say that the content is as impressive as the cover and you will not be disappointed in reading and owning this book. As a newcomer to the world of spellcrafting, I was pleased about the breakdown and content of the information in this book. The book is divided into three parts: Spellcrafting; Spells and Rituals; and Protective Objects. Part One explains what a spell is, how spells work and the basics regarding spellcraft; which is very useful to a newbie like me. Part Two consists of spells focusing on defense and protection and are divided into four categories. Lastly, Part Three provides the reader with three protection rituals. One for protecting a home, one for protecting an object and one for protecting a person. Protective objects are also discussed in Part Three. In the first chapter of the book, which also serves as the Part One, types of spells are explained. This is particularly helpful to someone who has little to no knowledge of spellwork. Chapter One reinforces that the most important part of a spell is the practitioner’s will and intention to be the agent of change. Part Two consists of four chapters each covering the following categories of spells: Body and Spirit, House and Home, Family and Friends, and Out and About. Each chapter begins with information regarding the spell category. Spell names are highlighted and written in a consistent format which is easy to read and follow. Under each individual spell is information on how or what the spell will help with followed by materials needed to execute the spell. Each highlighted area concludes with “What to Do” which is a step-by-step explanation of how to complete the spell. Tips regarding the spell may also be included in a separate highlighted information box. Part Three consists of two chapters. Protection rituals are provided in Chapter Six. They, like the spells in the earlier chapters, follow the same familiar, easy-to-read format that the reader has come to rely on. Chapter Seven, the ?nal chapter, discusses protection objects. Protective colors, crystals, gods, saints, angels, animals, herbs and symbols are explored. This chapter is an introduction protection objects, and it gives the reader some basic information regarding these objects. It is intended for this chapter to spark the reader’s interest in wanting to learn more about protection objects. In conclusion, Protection Spells is a well written and highly organized book that I would recommend to others. Upon completing the final chapter, I was left wanting more information. I was saddened that the book had come to an abrupt end; which is my only disappointment in reading this book. After having the opportunity to learn so much about protection spells from Ms. Murphy-Hiscock, I was left wanting a conclusion or parting words. Given the inclusive outline and impressive organization of the book, it was the one lacking piece. Overall, the lack of a parting chapter is a minor oversight given the wealth of information gained in reading this book. Reading the Elder Futhark Runes as a form of divination is intriguing, amazing and enlightening. Remember last month when I pulled the rune Isa? I was locked in a stagnant situation, unsure whether to move forwards forcefully or relax and wait out the freeze. My day job, which I had wanted to leave for some time, was tentatively offering opportunities but then snatching them away, leaving me stuck and not knowing whether to take the plunge. Well, after some contemplation, I realised Isa was telling me that I was allowing myself to be frozen. I was giving in to the temptation to stare into the frozen lake; to marvel at the river that has stopped flowing. So, I quit! That’s right, beloved readers, I am outta there! I am now a full-time freelance writer and student of the esoteric and occult. I was grateful for the rune’s guidance. Ultimately, I guess I would have made the same decision regardless of that particular rune reading. However, it was illuminating to realise just how stuck I had become, and how much longer I could be potentially stuck there if I didn’t make a move. After my exploration of Isa, I pulled the rune Dagaz. Two triangles or arrows touch points, or as I see it, one continuous line zig-zags around a central point. The name means ‘day’ or dawn, and it’s associated with awakenings and breakthroughs. 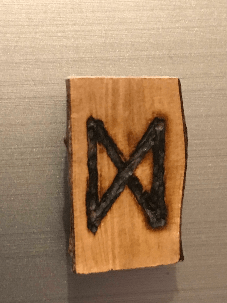 How astonishing that I should have pulled this rune just as I was fretting about being stuck somewhere, and never finding a breakthrough! It certainly seemed like a clear message. Dagaz is associated with things that have been planned and talked about coming to fruition. The imagination has been hard at work. Now it’s time for action. Things you never quite understood or realised are suddenly so clear or obvious. Dagaz is also about the inevitability of change. It’s almost directly opposed to Isa in this way. Isa is frozen, cold, unmoving, only hinting at the growth to come after the cold winter. Dagaz is a sure reminder that the world turns, the seasons move on and everything changes. Dagaz is also about mystical and spiritual inspiration; being open to divine intervention. I feel that this is really appropriate right now, when I have taken a leap of faith quite literally with regards to the work situation, but also allowed myself to explore the possibilities of this realm of divination and interpretation of signs and messages. I realise I have only scratched the surface of this intriguing rune, but I’m so blown away by how accurate and meaningful this reading is. Isa told me I was stuck, and reminded me that by staying where I was and not taking action I could metaphorically freeze to death. Dagaz highlighted that I’ve made myself receptive to these insights, showed me that action would be the way to break free, and assured me that moving away from my work-based debacle was the right thing to do, no matter how drastic. Today, I pulled the rune Tiwaz, Tyr’s rune; the rune of justice and sacrifice. I’ll write more about this and what it may mean for me in next month’s column. Don’t forget, you can tweet me @Mabherick if you want me to focus on a particular rune for this column. Until next time! Being an astrologer, I am always on the look out for books that are clear and concise in a format that is easily understandable by the lay person. Astrology for Success by Cass and Janie Jackson fills that niche quite nicely. In fact, their other books seem to also follow this premise that simple is best. The authors have chosen to focus on the Sun Sign in a natal chart as the tool of use in understanding your innate potential. This decision aligns quite nicely for those who are accustomed to reading daily horoscopes that, most often, are Sun Sign based. I would venture to guess that most people know at least their astrological Sun Sign, if for no other reason that as a fact of trivia and identification. So, this book already speaks to a broader audience than many books on astrology would. Each of the thirteen chapters is dedicated to a single astrological sign, in accord with their placement around the flat wheel. The thirteenth chapter is a charming teaser for anyone who wishes to explore another biggie in the natal chart- your Rising sign. This little tidbit at the end adds another layer of interest beyond the personality and traits of the Sun Sign. Each chapter analyzes the Main Characteristics of the astrological sign, the Plan for Success based upon the innate potential of that sign’s characteristics, Health, Relationships, Career Paths and highlights of Chronological Patterns that potentially play out in the course of the individual’s lifetime. Although the chapters are short, there is enough to sink your teeth into and prompt a deeper look in self-analysis and awareness. This is definitely a book I would recommend to my students and clients who are interested in having some usable information on hand in a simple format.